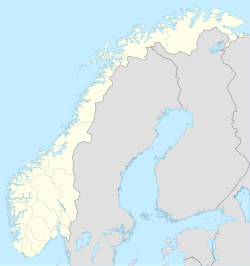 Hansnes is the administrative centre of Karlsøy Municipality in Troms county, Norway. The village is located on the northeast side of the island of Ringvassøya, along the Langsundet strait. By car, it is about 58 kilometres (36 mi) northeast of the city of Tromsø. The Langsund Tunnel is an undersea tunnel that is being built about 10 kilometres (6.2 mi) south of Hansnes, that will connect the islands of Ringvassøya and Reinøya. The tunnel will replace the ferry service from Hansnes to the nearby islands of Karlsøya, Vannøya, and Reinøya. The 0.49-square-kilometre (120-acre) village has a population (2017) of 493 which gives the village a population density of 1,006 inhabitants per square kilometre (2,610/sq mi). Hansnes is home to stores, a gas station, a bank, a café, a medical center, Ringvassøy Church, a school, a day care, and nursing homes. ^ "Hansnes, Karlsøy" (in Norwegian). yr.no. Retrieved 2012-12-16. ^ Store norske leksikon. "Hansnes" (in Norwegian). Retrieved 2010-03-16. This page was last edited on 10 August 2018, at 00:26 (UTC).